North Carolina Tesla ban? Bill would prevent "unfair competition" with car dealerships. 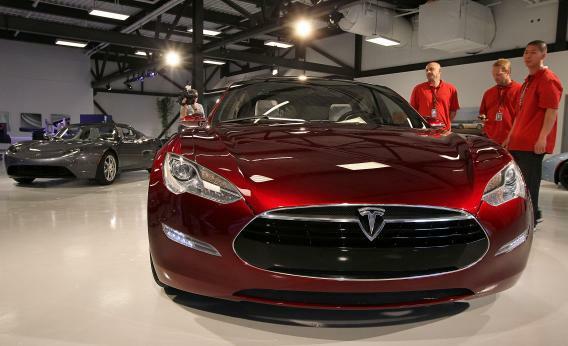 Tesla sells its Model S online and has showrooms in several states, but North Carolina wants to prohibit the company from selling cars unless it goes through third-party dealerships. From the state that brought you the nation’s first ban on climate science comes another legislative gem: a bill that would prohibit automakers from selling their cars in the state. The proposal, which the Raleigh News & Observer reports was unanimously approved by the state’s Senate Commerce Committee on Thursday, would apply to all car manufacturers, but the intended target is clear. It’s aimed at Tesla, the only U.S. automaker whose business model relies on selling cars directly to consumers, rather than through a network of third-party dealerships. The bill is being pushed by the North Carolina Automobile Dealers Association, a trade group representing the state’s franchised dealerships. Its sponsor is state Sen. Tom Apodaca, a Republican from Henderson, who has said the goal is to prevent unfair competition between manufacturers and dealers. What makes it “unfair competition” as opposed to plain-old “competition”—something Republicans are typically inclined to favor—is not entirely clear. After all, North Carolina doesn’t seem to have a problem with Apple selling its computers online or via its own Apple Stores. Still, it’s easy to understand why some car dealers might feel a little threatened: Tesla’s Model S outsold the Mercedes S-Class, BMW 7 Series, and Audi A8 last quarter without any help from them. If its business model were to catch on, consumers might find that they don’t need the middle-men as much as they thought. Incidentally—not that he would be in any way swayed by this—I couldn’t help but notice that Apodaca received $8,000 in campaign contributions from the North Carolina Automobile Dealers Association last year, the maximum amount allowed by state law. I’ve reached out to the senator for further comment and will update this post if he replies. Tesla’s vice president of corporate and business development, Diarmuid O’Connell, told me he’s hopeful that the state legislature will amend the bill so that it doesn’t prohibit Tesla from doing business there. He said the company has already sold 80 cars in North Carolina, mostly through the Web, and has about 60 more orders in the works. It also has plans to build its first showroom in the state next year. The Raleigh-Durham Research Triangle in particular appears to be a hotbed of Tesla interest, O’Connell said, which makes sense given its similarities to Silicon Valley. In its current form, North Carolina’s bill would be the harshest of a handful of anti-Tesla regulations around the country. In Texas, the company is fighting a law under which the employees of its “showroom” in Austin are not allowed to sell any vehicles, offer test drives, or even tell customers how much the car costs. But at least Texas still lets people buy the car online, which North Carolina’s law would prohibit. Tesla’s O’Connell rejects the idea that laws prohibiting automakers from selling their cars are designed to protect consumers, as trade groups like the North Carolina dealers’ association claim. He says the franchise-dealer model might work fine for giant automakers, but not for a startup like Tesla—especially since Tesla’s products represent a challenge to the traditional auto industry on which dealerships rely. “How do you sell the future if your business depends on the present?” he asked. If that’s the real issue, then I may have some good news for all concerned: I asked O’Connell, and he assured me Tesla would be happy to support the little leagues and the YMCA if that’s what North Carolina requires in order to do business there. Problem solved! Right, Mr. Glaser?